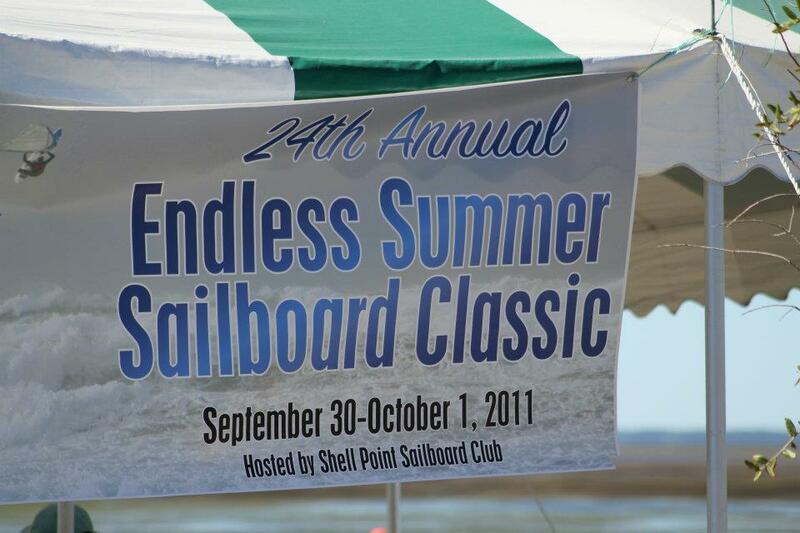 The 24th Annual Endless Summer Sailboard Classic (click here to see all photos) has come and gone, and through no fault of yours truly, it was a smashing success. I have to give a big thank you to our sponsors - Ezzy Sails, Leah Chapin, HobbyTown USA, Native Tikis, DJBobbyG and DaKine. Not to mention HomesteadTshirts.com, WorldWinds Windsurfing, Chums/Chisco, VAPA, Corner Pocket, US Tennis Association, the Grey Fox, and Tri-Eagle/Budweiser. An event like this doesn’t happen without an army of support to make it look like I knew what I was doing. Special thanks to Bob Graves and Sandy Layne who handled pre-registration, event accounting, sound and music, swag distribution and everything else. Enjoy that cruise, I don’t think we will be audited this year. Every year there are people that step up and make things happen, many that I never thought about, Wright Finney – Site and facilities, spiritual guidance; Perry Morris and John Gilbert – Course management and rescue; Mark Voigt and Lee Chapin – Race captains; Tina Mazaneck – C Fleet Captain; Cathy Voigt, Sandy Layne and, in spirit, Ann Getman – on site Registration; Leah, Lizzy, Donna, Janice, Judy, Kathy – dinner service; Adam Bennet – beer truck operations; Café Donaldo – New York, Paris, Kuala Lumpur, and Shell Point; Scott Williams – Dogs by Scotty; Rick and Judy Knerr– wings n’ whiskey; Bob Andrews – Ice, ice baby; Dave and Lizzy Denmark – firewood; and Stan Derzypowlski. We had eight entries for the Gumbo Contest and it was a hard fought battle. Congratulations to Judy Knerr for the stand out contest winner. My strategy for something different sort of worked, got an honorable mention and yes, Gumbo z’herbes is Gumbo! 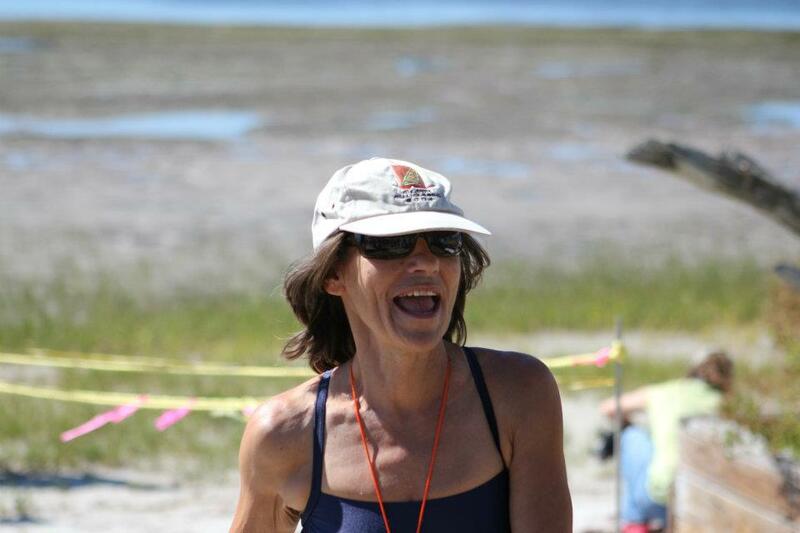 We had an outstanding C fleet, captained by Tina Mazaneck, which included new students and some from last year. Way to go Alex, Frank, Laney, Colbi, Eberhardt, and Adam for great racing under challenging conditions. 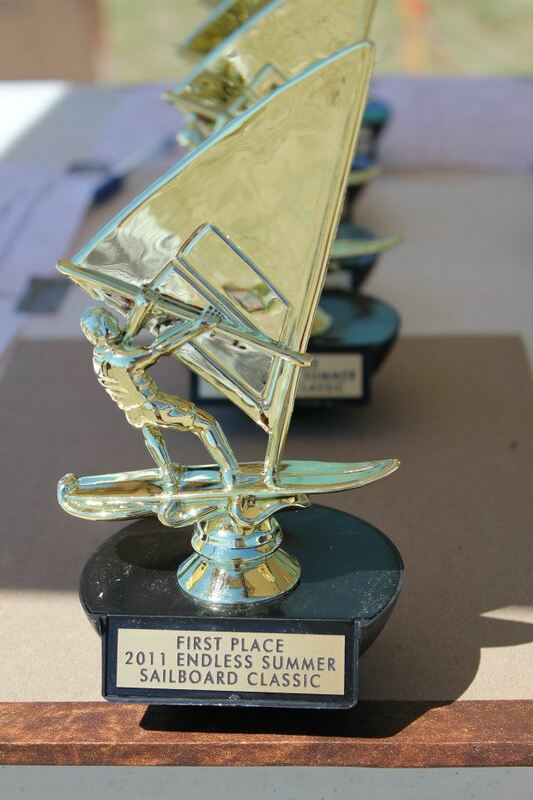 We had close to 100 students this year and the real competitors showed up for this regatta. The course conditions were challenging this year to say the least. A northerly wind and NO water made it tough for all the competitors, except Dave Stanger, of course. Perry and John set a great course to take advantage of what we had to work with. Special kudos to Bob Andrews for stepping up to A fleet. Scoring was again provided by Bob Graves, who again did not win the whole thing, despite scoring and racing. Sharman Franklin was the worthy recipient of the Perry Williams Award, many thanks for all you have done for the SPSC. Special thanks to our out-of-towners- Dan and Dave from Charleston, Dan, Sherry, and Chris from Atlanta, and Niels for Jacksonville. Now we segue into the Atlanta Fall Classic, put on by the Atlanta Boardsailing Club and the Lake Lanier Sailing Club. It looks like we will have a nice contingent from SPSC headed north to enjoy this event. It has been close to 15 years now that I have somehow been involved in breakfast on the beach for Endless Summer. Smith Regatta came along later but it all started with Endless Summer. Some of you will remember the famous Mill Muffins. I got talked into taking over muffin duty from Laura Chambers one year. Muffins were easy – just bring out the boxes and let them feast. When the restaurant closed, things changed. There MUST be coffee! ..and so began the ritual of early mornings on the beach. Each time provided an opportunity to watch a unique sunrise develop as the coffee brewed. Not only does the sky slowly come to life, so does the Regatta site. Although there are not so many campers as there used to be there are still two primary groups: Zombies crawling to the nearest bathroom trying to not really wake up just yet, and Early Risers ready to lend a hand in exchange for java. The zombies usually disappear again to their tents, emerging sometimes hours later, still crawling and now desperate for caffeine. John Gilbert has long been one of the early risers. Some years it could be a CSI Shell Point as evidence of last night’s escapades comes together in the new day. John has it all squared away before most others are up and about. The Lost Boys also get an early start on the day. When they are camping, they are usually some of the first to show for a cup of joe, and help with beach clean up and setting up the breakfast spread. Condo camping has not changed things, thankfully. It must have been an omen but we had joked at a Board meeting about the early riser coffee addicts coming to find me if I ever overslept. Well this year it happened. Thanks to Chris Voith being up early Saturday morning, and being able to see my place from the studio, breakfast was on time. It must have been quite comical. I was in such a deep sleep when he knocked on my door I questioned why he was even here, let alone in my kitchen before dawn. Dave Stanger showed up a few minutes later and miracles began to happen. They helped me make the starter coffee, find and pack all the food stuffs and serving set ups, load up my car, and still be at the beach by the published 7:30 start time. Thanks again guys – from everyone!! Saturday and Sunday mornings have very different character but always interesting. Saturdays are a mix of folks; all busy with greeting old friends, late comers registration, initial rigging, and tales of Friday’s nights revelry. Sunday mornings, it’s usually just a few racers to start, reviewing Saturday’s results and considering rigging changes. Not sure I can remember a race committee meeting ever really happening at the published 8:30a. As other participants emerge, recollections of Saturday night become the banter. It is probably a good thing my hearing and memory are so bad. The kids are always fun as they come up to the table and just stand there looking; must be tough to be table tall and hungry. It usually takes some encouragement to help themselves to a muffin or some grapes. Mostly they wait for mom or dad to join them and approve accepting food from that strange lady in sunglasses that talks to herself. Every year I say its time to find a replacement so I can sleep in for a change but then each morning as I walk out on the beach and watch the day come to life, I am happy to be there. The sunrises and your smiling faces make it worthwhile. The weather was perfect with cool nights and comfortable days. 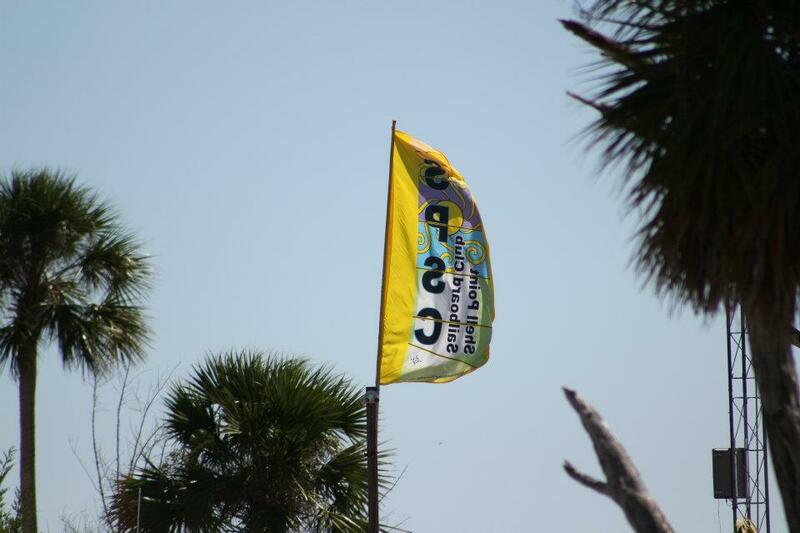 The wind was good but not perfect with gusty northerly winds from 10-20 knots on Saturday. Sunday brought northerly winds 5-10 then dying out by 11am. 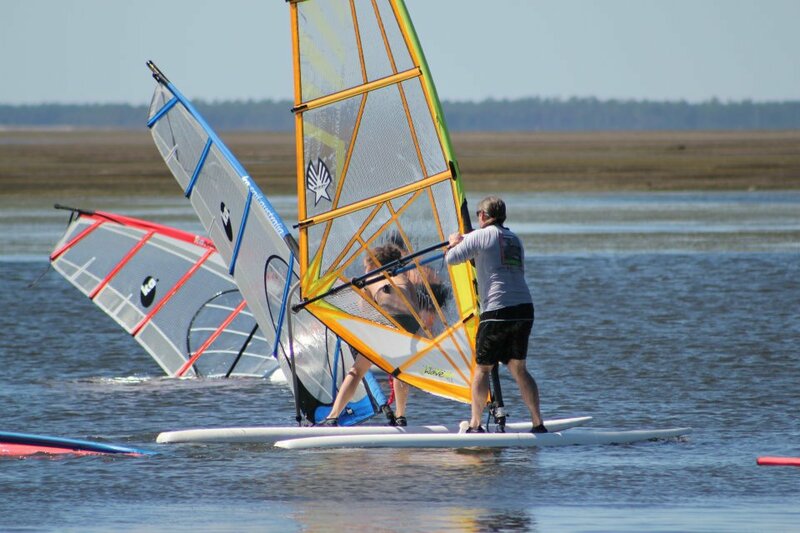 The winds challenged this windsurfer so much that he gave up challenging the other windsurfers. The race course was an excellent setup, given the low, low tide. I chose the very time-consuming strategy of pinballing (i.e running aground first on the east side of the channel then running aground on the west side of the channel and so on as I beat upwind back toward the finish line. The race committee vessel (3 chairs in da mud) was a curious but welcome site as I finally finished. The race committee was very patient with me and my long overdue finish since they had no shortage of runners to go fetch more beers from Adam’s ‘lil beer wagon. 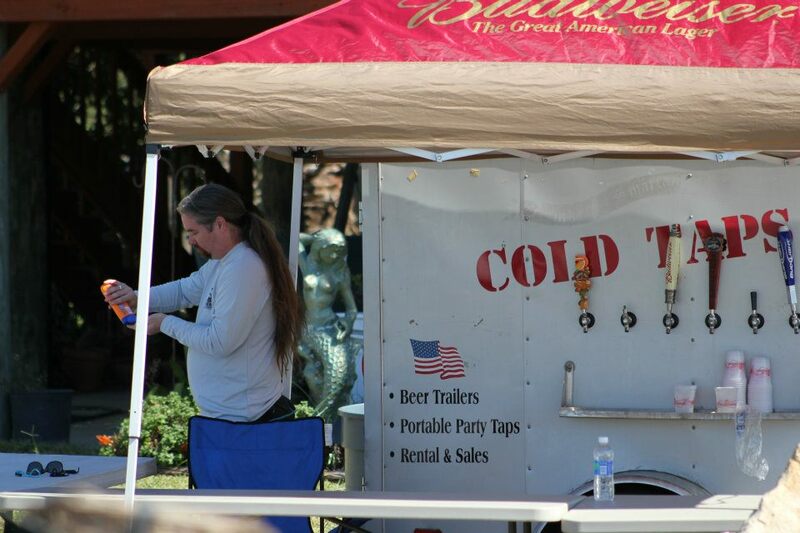 It was no beer truck but due to the contents, it was still one of the most popular gathering spots during the weekend. 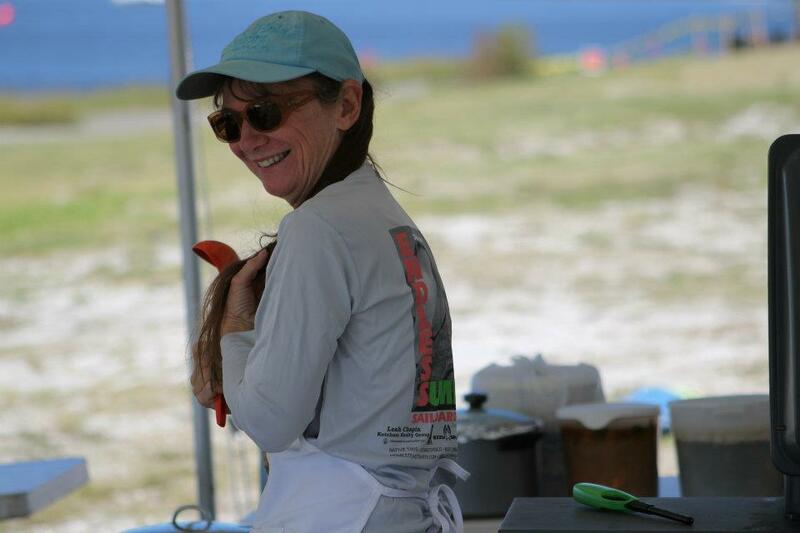 Kudos goes to Café Donaldo, Scotties Dogs and all the gumbo chefs for fortifying the masses during both days of racing. Accolades go to Rick and Judy Knerr for Friday night’s wings, fries and veggies. I personally would not have had the energy to rig and pinball if it were not for the always excellent breakfast fare offered up by Linda Downey. Though I did not participate in the licca “tasting” Saturday evening, I understand that more than a few registrants got a wee bit hammered, gravity-challenged, lit up or just downright over indulged. There is a proposal for future regattas to set up a railing (not unlike the drying racks though much shorter) with a deep ditch on the leeward side of the rail. It shall be known as the retching rail, a place of “comfort” for those who get too carried away at the tasting table. Meeting called to order at 7:34 with a ketchup gavel since Bob A. had to sub for his Excellency, Commodore Bill, who did not leave his mighty gavel behind. We went over the calendar of events. 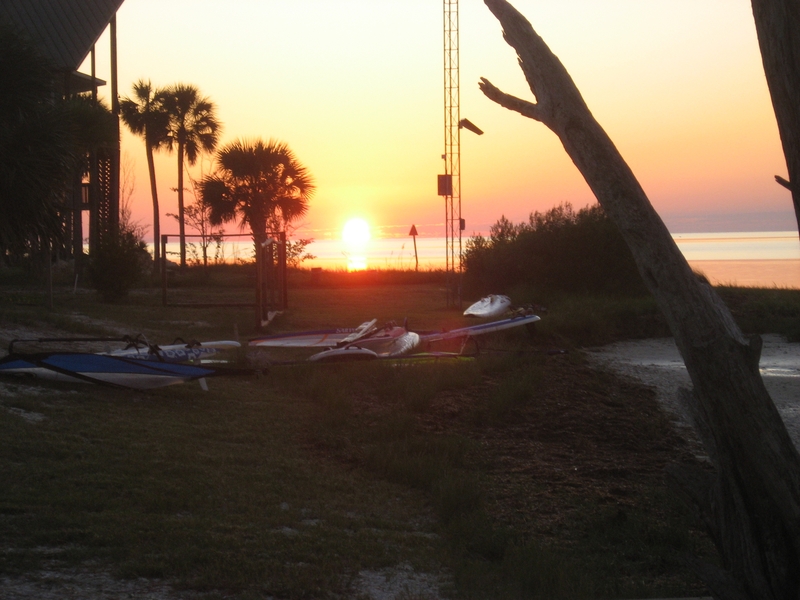 New Keys trip date is February 2-13, 2012. Some discussion followed but everyone seemed happy. No objections. Everyone wanted to know if Mark Voigt’s brother could come back. Bob A. asked who is planning on attending the Atlanta Fall Classic at Lake Lanier. Several folks responded, many didn’t, some looked puzzled, and others wistful. Sandy woke up the Scribe who, typically, had nothing to say for the scribe’s report. Training reported they have one new sailboard in service. 110 people (this number includes people who were trained more than once) were trained. Had to buy a new mast and we still need more 400cm masts, so if you have one you aren’t using, please donate it to your local SPSC. We have a decent balance in our budget. Dues were due today and people were handing money to Wright, left and right. Hopefully Wright got the right amount of the dues due. A silence befalls the congregated masses as voting goes on. Security is posted at the door to ensure this sacred and solemn moment is not interrupted. Everyone is hoping that it is NOT them elected. Meeting continues after the voting while some members of the esteemed (steaming?) body count the votes. Trailer is ready to roll in its role of being a portable housing unit in case of a storm. Read article in last month’s newsletter ("Changing A Tire ...") in order to find out how it became ready when it had not been before. Inspiring. Dave suggested pontoons for the trailer. You have to remember, Dave plays the guitar, so we all smiled and said “great idea”. He suggested using Jack’s guitars as pontoons would put them to better use. Lee spoke about a Windy substitute and said he could get it up shortly. We older guys in the crowd were impressed. Election counting was done and the results are: Commodore: Bob Andrews, Vice Commodore: Mike Levine, Scribe: Bob Graves, Purser: Wright Finney, Board member: Ann Getman, Board member: Mark Powell, Board member: Mark Voigt, and Board member: Perry Morris. Ezzy donated a 9.5 sail for the Endless Summer grand prize drawing. Ezzy shows up as a misspelling in my word document. Took care of that and added Ezzy to my dictionary. It was suggested that people order shirts one size smaller than normal since the shirts for this Endless Summer are long sleeve athletic shirts that fit more tightly. Someone suggested the women should get shirt two sizes smaller. Don had brought some shirts for folks to try on. Sandspur roundup will be at 2pm on the Sunday before our event. We also need to treat for ants. Linda mentioned she had about 7lbs of hamburger and 110 hot dogs for Café Donaldo of New York, Tokyo and Shell Point. 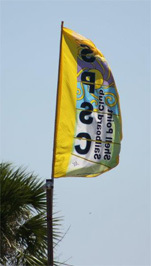 Site preparation will begin around 2pm on Friday of the Endless Summer weekend.